I'm really into low ingredient, high health, pretty food right now. I'm trying hard to steer my household away from processed foods, and I'm trying to do better about working with fresh vegetables. By the way, trying are really the key words here. I still can't get my other half to stop buying insane amounts of candy. I'm so envious of his metabolism. I'm also currently wracked with cravings for anything even remotely Asian inspired. I go through phases where I crave the same genre of food for weeks at a time. Sometimes it's seafood, sometimes burgers. Lately, it's Asian food. So this recipe was born out of creativity and a desire for something filling, tangy, and easy to eat. I wanted acid and crunch and earthiness. 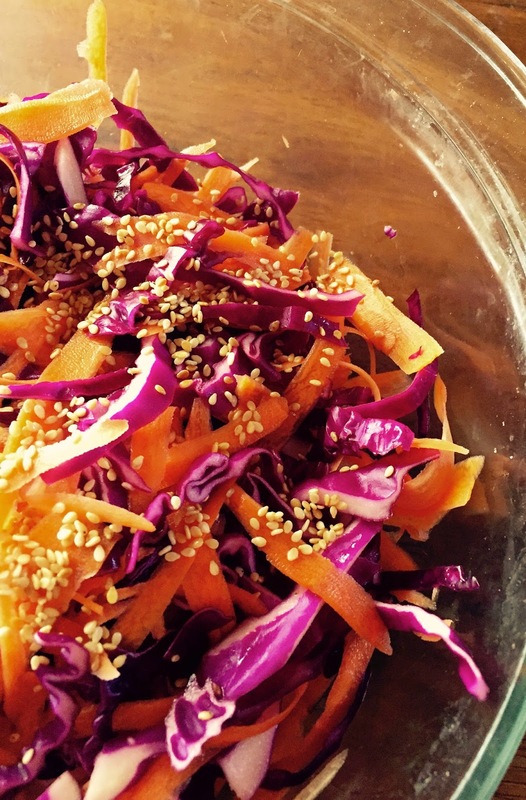 This recipe makes a good sized amount of slaw, and it certainly does get better as it mellows in the fridge. I'll eat this straight out of the bowl, or on the side of some baked tilapia, or I'll make it the base of a baked chicken and avocado wrap (pictured below), which I highly recommend. You want to shred or slice your red cabbage length wise, so it is in nice long stripe. Peel the carrots and then run them lengthwise through a mandolin is you have one, or just use a vegetable peeler run down them over and over until you have very thin strips of carrot. Put the carrots and cabbage into a large mixing bowl. In a heavy saute pan, toast the sesame seeds until they are just turning a little brown. Add the rice wine vinegar, sesame seeds, salt and a few drops (be sparing!) of sesame oil into the vegetables and mix well. Let sit for half an hour before serving, but if you need to dive in right away I'll never tell, and I'll totally forgive you. Serve on the side of baked chicken or fish, or add to wraps. This would be awesome with shrimp tacos too. Christmas day was a bit rough this year. My other half was working all day so we celebrated on Christmas Eve instead. I wasn't really up for staying home alone all day, so I went to see a show that a friend of mine works on. After the show, I was thinking about dinner and about how I really really didn't want to cook. As I was walking back to my car, I passed by Lupo, Wolfgang Pucks restaurant at Mandalay Bay. I decided... screw it. I'm going to make something good happen to day. So I set up at the bar and ordered a really lovely dinner. I drank Seghesio Zinfandel 2012, which is always a winner. I actually went to the Seghesio Vineyard back in April, and I really like it. It's also a huge favorite of my friend Jenn's, and she has excellent taste as always. The it was Gnocchi with Veal Ragu. The ragu was a hair on the salty side but the gnocchi was absolutely perfect. Light, fluffy, delicate, exactly the way it should be. I asked the bartender to pick me a side, and he settle on Lemon Parmesan Cauliflower. I'm going to probably try to recreate this. It was perfect. The citrus against the Parmesan really worked beautifully. It had just the right amount of caramelization and I really loved it. If you're having a crappy day, sometimes it's worth it to just say Jai Refuse!, and make it into something better. You have more control over your destiny than you sometimes think. I like weddings. I find them neat and sweet and I've been lucky enough to have gone to many. They are all memorable for different reasons, and I like that I remember little glimpses of peoples days. Uneven flagstones at Heather's wedding. The way the wind whipped Alana's dress. A baby crawling across the floor at Michelle's and me nearly splitting my bridesmaids dress reaching for him. Anna rushing for her sister when her hair started to come undone. Kirsty waiting for the right moment in the music to start walking down the aisle. Speaking of Kirsty, she's the younger sister of my dear friend Tree and she had a really awesome little Las Vegas wedding. We ended up having her reception in a cocktail lounge on top of the Delano here in Vegas and I had an amazing cocktail there. It, of course, had champagne in it since I was at a wedding after all. 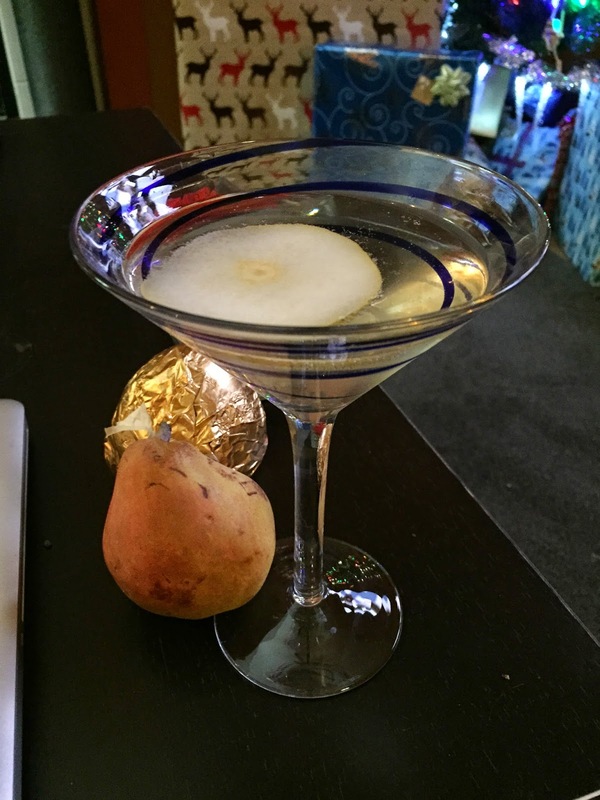 The inaugural blog post of 2015 and the first (hopefully not last) of my new mission to play with all of the liquor in my bar features Pear Grey Goose.... which I bought specifically to make this cocktail. We'll not discuss how many times I made it in order to try and get the ratios right. Suffice to say, I've made a small dent. For the Champagne/Prosecco/Sparkling Dry Wine any will work. Bear in mind that if it says sparkling wine on the label it doesn't mean it's not worth drinking.... technically it's only Champagne if it's from Champagne, France and lots of Vineyards respect that tradition and don't mislabel their product. In a cocktail shaker, shake the Grey Goose and St Germaine with plenty of ice. Strain into a glass and top with the Champagne. Garnish with a pear slice if you wish. If you don't have pears handy, don't let that deter you, because I think this drink is lovely.